Here you will find vineyards, lakes and mountains which create a scene of total harmony - perfect for a whole variety of hikes and treks, from the most quaint and picturesque to the most magnificent and palatial scenery the Alps can offer. This is followed by an oenology presentation by the wine producer, who will also offer generous wine tastings of all his different wines, some of which are rare. ​​In the vineyards of the Parcs Naturels of the Bauges and the Chartreuse, which dominate the valley (on the site of the greatest natural disaster in the Alps) there is an landscape to take your breath away, lots of history, delicious wines can be tasted at the wine producers cellar. Mountain hiking and wine tasting in the vineyards (a unique experience not to be missed) where we will spend a few minutes on the mountain ridges with superb views overlooking the surrounding countryside, then onwards to the wine producers cellar for tastings that will amaze you.Cliquez ici pour modifier. ​In the vineyards in the Bauges and the Chartreuse and also in the area around the Lac du Bourget, discover the vineyards in a vehicle and by easy walks. Two or three days: two or three different mountains (two of which are natural parks) and two or three different vineyards with an incredible number of crus to taste. No region offers, in such a small area, so many chances to discover so many beautiful landscapes, so many superb and unique crus to taste and so many stories and legends to listen to. Unique experiences can be had – every day hikes or treks in the mountains above the vineyards, everyday the most amazing views, the natural lakes to discover (swimming is possible) everyday the vineyards are magnificent with their different and delicious crus. * Hiking/Trekking in the mountains of the Parc Naturel de Chartreuse – then lakes and vineyards in the Chartreuse with wine tasting of the local wines, some of which are rare. * Hiking/Trekking in the Parc naturel des Bauges – Leaving from the Lake at La Thuile, then walking down into the vineyards to have a wine tasting of local crus, some of which are rare. 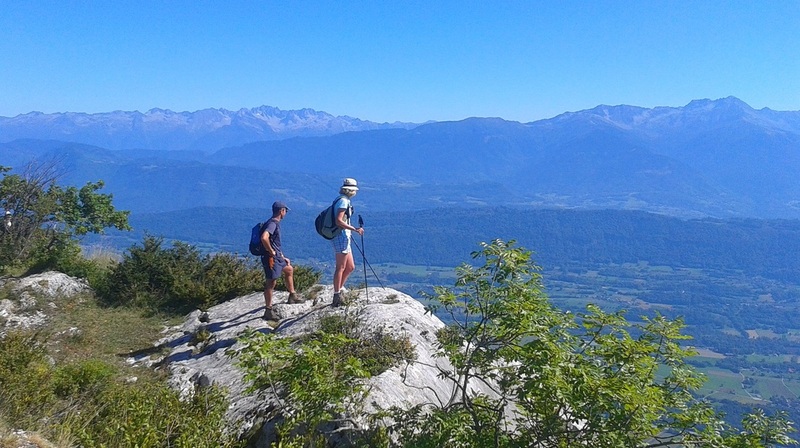 * Hiking/trekking to the “Dent de Chat” which looks over the Lac du Borget, the largest natural lake in France – then walk down into the vineyards of Jongieux which is classed as a French landscaped heritage area – wine tasting of the superb local wines, some of which are rare.